KANSAS CITY, Mo. 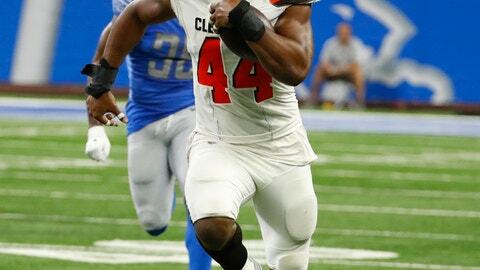 (AP) — The Kansas City Chiefs signed former Cleveland Browns linebacker Nate Orchard on Wednesday to shore up their pass rush with linebackers Justin Houston and Dee Ford hobbled by injuries. Houston could miss several weeks after hurting his hamstring in Sunday’s win over Jacksonville, and Ford has dealt with a series of minor injuries this season. Their backup, Tanoh Kpassagnon, also has missed time with a bothersome ankle. The Chiefs signed Frank Zombo, who had spent the past five seasons with Kansas City, when they put offensive guard Laurent Duvernay-Tardif and safety Armani Watts on injured reserve Tuesday. The 25-year-old Orchard was a second-round pick of the Browns in the 2015 draft. He spent three seasons with them before briefly joining Buffalo earlier this year.